You want it so badly that you can already taste it. But you can’t taste it…unless you buy it! 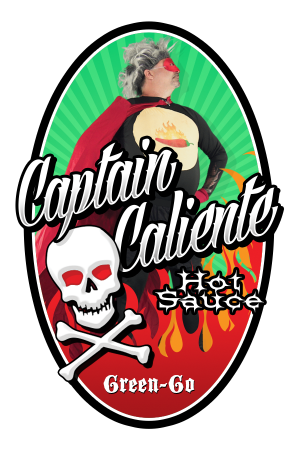 Captain Caliente is a small batch hot sauce company. Each sauce is hand made in 10 pound batches of hot peppers then hand bottled. The recipe remains the same. 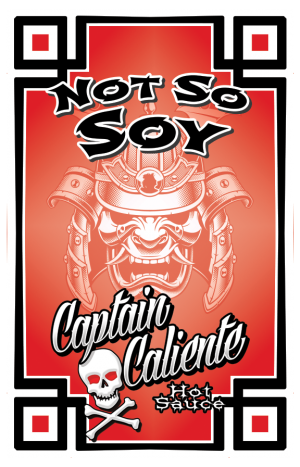 The Captain is very particular about the flavor of every single bottle. Each pepper used has a specific flavor profile that adds to the unique blend of super hots. There is a fruity, salty, tangy, sweet, smoky and powerfully tempered heat in the formula. The Captain is willing to share a tantalizing look into each pepper used and why. The delicious super hot peppers are all grown in an aquaponic garden. This is a natural process. It uses fish poop as fertilizer and continuously recirculates water to the roots of the plants 24/7. The plants are in grow beds full of river rocks. Red worms have been let loose into the rocks to add their Vermiculture to the system. The worms wrap around the roots, eat fish poop solids and other fungal debris that could otherwise promote pathogens. It is a clean and and somewhat rudimentary technology. Many agricultural scientists, aquaculturists, and botanists remain unconvinced that aquaponics is able to sustain a long term viability for agriculture in America. This is because plants and fish have a natural PH level that contradict one another. The plants want a PH level of 6.5 and the fish want a PH level of 7.5. But what happened to the idea of “adaptation”? Within roughly 6 months a nicely engineered aquaponics garden will produce a culture that is self promotive of all living parts of the garden. This too, has captured The Captain’s imagination. Hot Peppers Are A Fruit. What? It may defy logic but chile peppers are technically a fruit. Aquaponics is the inevitable future of agriculture. The Captain is often times seen mumbling about the subsequent fate of hot peppers along with all produce if things do not change soon. This garden is able to yield copious amounts of peppers continuously for a minimum of seven months a year. 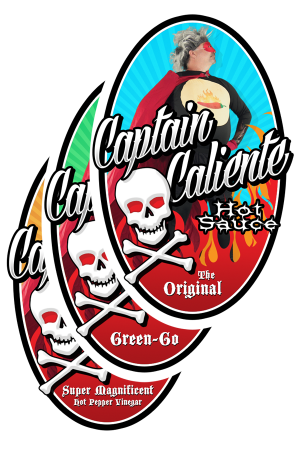 The Captain will bottle as many sauces as possible during this window of opportunity and continue to expand the gardens in order to provide as many souls as possible with this unique array of flavors. Join The Captain on this amazing adventure as he is a part of forging a path for agriculture in America, the world beyond and hot pepper enthusiasts when it comes to growing the amazing genus of Capsicum. Trinidad Scorpions are truly amazing specimens. These are heirloom varieties. All natural and beautiful. Captain Caliente uses both red and yellow Trinidad Scorpions in the sauces. 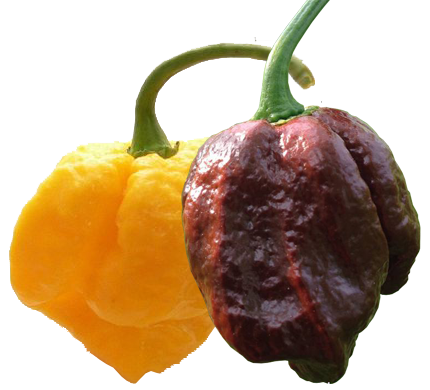 The Yellow Trinidad Scorpion – Is actually a bit less “hot” than the red. But when you are talking about a million on the Scoville Scale does it really matter? On some level, it does. The yellows offer a bit more of a fruity flavor. A bit more tropical than the reds. It is definitely a distinctive flavor profile. 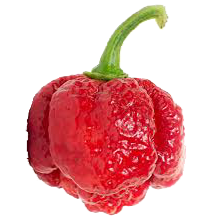 The Red Trinidad Scorpion – It is amazing how hot this pepper is considering how many peppers are engineered to be even hotter. But this is au natural. It provides a nice baseline heat to the sauce that only a red can do. The Moruga Scorpion was engineered by Wahid Ogeer in Trinidad. And God Bless him. It’s considered one of the hottest peppers in the world. It registers at some 1.2 million or more on the Scoville Scale. 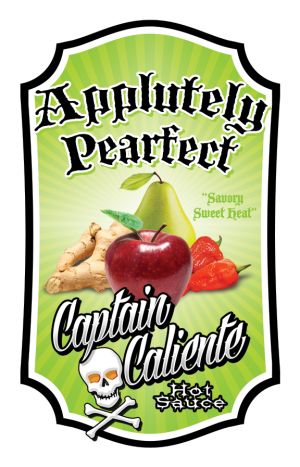 Captain Caliente uses this gorgeous pepper as a heat modifier. Sure it’s hot. But The Captain incorporates just enough per batch. Just enough to give that fruity burn as is slides across your tongue to the back of your throat. The sauces would not be complete without this amazing pepper. 7 Pot peppers get their name from the concept that one pepper can heat seven pots of stew. The heirloom strain also comes from Trinidad. Such a small Island for so much flavor. There are heirloom varieties of these peppers. The two 7 pots in Captain Caliente’s sauce are engineered super hots. But both varieties carry a nice flavor that you can’t get anywhere else. The Primo Yellow – It’s hot. Let’s not mistake that. But it’s also a basic tropical fruity flavor. It adds a sweetness to the sauces. The Chocolate Doughlah – This pepper offers a nice hint of chocolate smoky flavor. It is actually a savory pepper. One of the most savory peppers around. And it is also one of the hottest varieties available. It still sits in the top 7 peppers of all time in regard to heat. 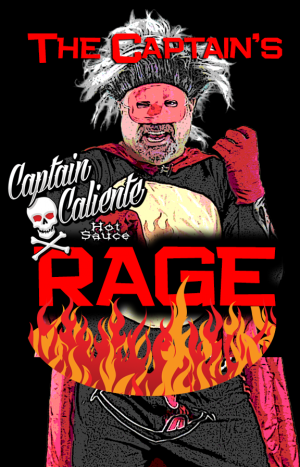 The Captain tempers this pepper in the formula to get just enough smokey heat. You’ll taste it on the back of your tongue. The Ghost Pepper. The name strikes fear in the hearts of many. But for us Chile Heads, Ghost Peppers are par for the course. We love them. We cherish them. 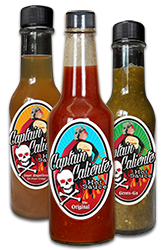 In The Captain’s sauce these three Ghost peppers play in important role. The Ghost Pepper – Otherwise known as the Bhut Jolokia is one of the most famous peppers in the world if not THE most famous. Another heirloom super hot. Such an incredible taste, such an incredible pepper. Originating from the Indian Sub-Continent this pepper is another fantastic addition to the variety of peppers in this sauce. There are those that use these spicy treats as snacks while eating dinner in Northern India. The Captain feels right at home with these individuals. This amazing pepper is a slow burn. But adds sort of a mango flavor to the overall product. You simply cannot go wrong eating this pepper in any dish you make. 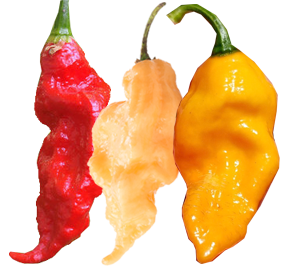 Jay’s Peach Ghost Pepper- (Depicted above as the middle pepper) is no joke. This pepper is a cross between a Ghost and a Trinidad Scorpion. It does not taste like a peach. It is hot. Yet it adds to the heat and color of the final product. It’s delicious and spicy. 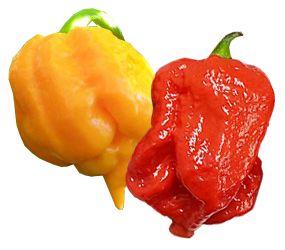 Sugar Rush – (Depicted above as the pepper on the right) – This pepper is a true gem. Maybe one of The Captain’s favorite of all time. It is a medium heat pepper with thick crunchy walls. 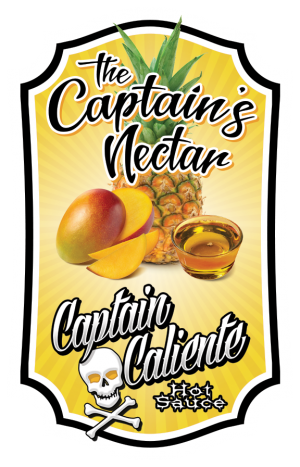 It offers an incredible fruit array of peach, apricot and citrus flavor. It is not as spicy as an habanero but the taste is so phenomenal that you should be eating this regularly. It reacts with the tangy flavor of the pure apple cider vinegar in a profound way. This pepper is one of the finest tasting peppers in the world. There are those that may dismiss the basic Jalepeno, Cayenne and Habanero. The Captain is not one of them. Every single pepper is special, each has its purpose. These peppers are considered staples in much of the world. And each of them offer a uniqueness to any dish you could make. Jalapenos – These are the baseline of spice. 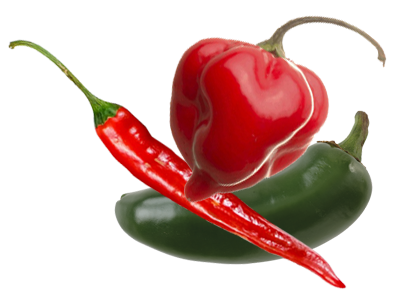 As soon as anyone starts to talk about hot peppers the Jalepeno comes to mind. And with good reason. They are the most commonly used pepper on the globe. Why shouldn’t they be? Yes, they have heat. But it is the bottom of the barrel. It is a very pleasant heat as well. So this pepper is used as a bulk pepper in the sauce. These benefits are simply incredible. Very healthy. And Cayennes are the most beneficial of all peppers. Thus, it would be remiss if The Captain did not include these magic peppers in his formula. Red Savina Habanero – Is it really a staple pepper? All habaneros are staple peppers. Imagine a world without habaneros. It makes The Captain sad to consider such a place. However the Red Savina is a mutant habanero. It was once considered the hottest pepper in the world but was displaced in 2007 by the Ghost. No one else really knew or cared about the heirloom peppers out there, at the time. It is the hottest habanero known to mankind. So why wouldn’t The Captain use this in his select sauce? It’s harder to grow than most peppers. Yet, it still has that nice floral fruit flavor you would expect from an habanero. Needless to say, it belongs in these sauces. If for no other reason, it is the best of the best when it comes to this particular variety. The Captain always loves top shelf, in every aspect of life.